Heh was the god of infinity and formlessness. He was shown as a crouching man holding out two palm ribs in his hands, each of which terminated with a tadplole and a shen ring. The shen ring was a traditional symbol of infinity. The palm ribs were symbols of the passage of time, in the temples they were notched to record cycles of time. The tadpole was a hieroglyph that represented the number 100,000. The image of Heh himself was with his arms raised was the hieroglyph for the number one million. 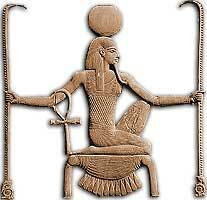 Heh was a member of the Ogdoad of Hermopolis. He and his consort Hauhet together were the aspects of formlessness and endlessness that existed in the universe prior to the Creation. In Hermopolis, he was depicted as a serpent.